This huge entertainment complex is essentially a theme park full of thrill rides, but was designed to be a recreation of Victorian Johannesburg during the gold-rush era. The park, four miles (6km) south of the city centre via the M1 motorway, was built around the No.14 Crown mineshaft that began operations in 1887 and closed in 1975. During its production years, 1,400 tons of gold came out of the shaft. Visitors can now descend into the old mine shaft to experience life at the rock face, and watch gold being poured and minted. Gold Reef City also houses a number of museums, and offers performances by traditional gumboot dancers and the like. Youngsters particularly enjoy the rides like the Anaconda roller coaster and Thunder Mountain River Rapids. There are so many rides that it is difficult to take it all in! The range of rides ensures that there is plenty for all age groups and a good mixture of the mellow and adrenalin-pumping. There are also plenty of restaurants, bars, a massive casino, and a Victorian hotel for those wanting to stay the night. 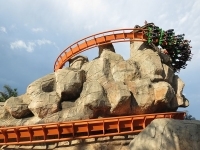 Gold Reef City is a must for families spending a bit of time in Johannesburg and is also located conveniently close to the Apartheid Museum, creating the ultimate touristic marriage of hard-hitting history and theme park fun.